My hands were itching to do a colourful and bright makeup look, as its been a long time i did one, so me and Prapti from The Red Lipstick decided to do a collab video and we picked up flowers as our inspiration. I still remember my first visit to her blog and instantly i fell in love with her beautiful makeup looks, love her blending skills and colour combination and not to forget her style with which she can carry off any look. Our friendship starteed when i left a comment on her blog and she sent me an email saying that she watche my videos and she likes my work, i was so happy with the fact that someone who's work i was appreciating shares the same feeling for mine. You can Visit her Youtube channel HERE. 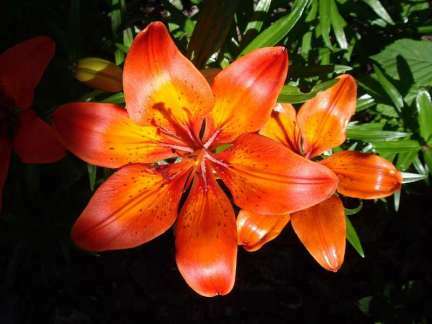 So , here is the inspiration picture, i love the bright colours of this beautiful lilly. I hope you guys liked this look !! You hands does magic Deeptima..